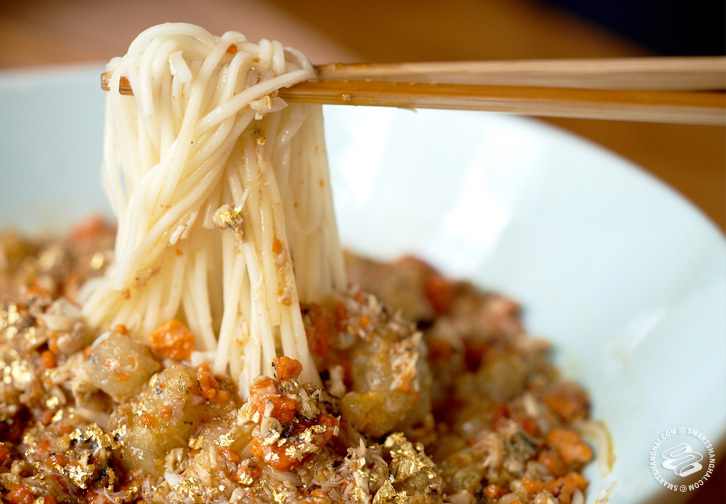 Is a 360rmb bowl of noodles a spiritual mission or extreme selfishness? Xu Jing sells noodles. They are outrageous luxury. They require four people to spend hours every day picking the roe and meat out of hairy crabs. 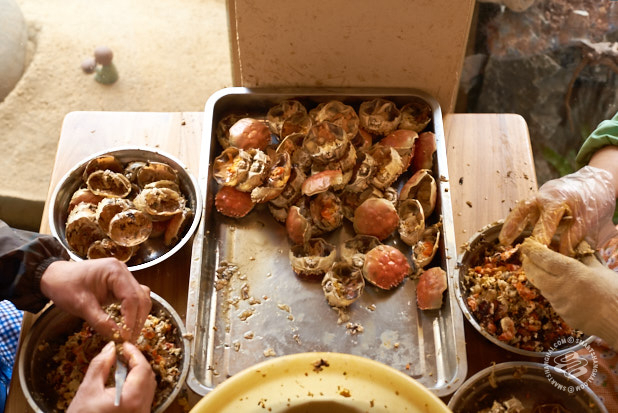 Each bowl requires 12 crabs; it is like eating caviar with an ice cream scoop. But Xu Jing has never tasted them. He is a vegetarian. And a religious ascetic. Xu’s noodles are a distillation of Shanghai’s materialist spirit, an inevitable dish of 21st century Shanghai and a monument to excess. A single bowl costs 360rmb. He sprinkles them with gold flakes. And yet Xu, whose wardrobe consists of a single robe, worn for all occasions and in all seasons, sees them as a mission to bring purity to the world. With the help of celebrities and gluttons. "Cejerdary" opened in the fall of last year, around the beginning of hairy crab season. (The name is an phonetic attempt at the Chinese original: Xie Jia Da Yuan.) One recent morning, I sat across from Xu at the restaurant. On the slab of tree between us that served as the table, he began brewing a clear tea of lotus seeds and pine needles he picked from ancient trees on his annual religious retreats. “My masters can read minds,” he tells me. “When I visit, they don’t ask me anything. They know what has happened.” Xu chuckles and leans in to challenge me. Before he traded in his Gucci and Armani for a thin robe, Xu owned a company producing thick wedding photo books. It was a lucrative business, made even more lucrative when the government knocked down his Hongqiao office. With the compensation from that loss, he went into the hairy crab business. But something was lacking. “I went out to my warehouse one day,” he says. It was 2011 or 2012. The warehouse was four or five hundred square meters, six meters tall, and packed with stuff. He points to a bottle of water on the table. “From the time we are born, we keep filling up the bottle,” he says. He raises the teapot to pour more water into the already-full bottle. He gave away the contents of the warehouse to friends, acquaintances, anyone who wanted them. That was the beginning. 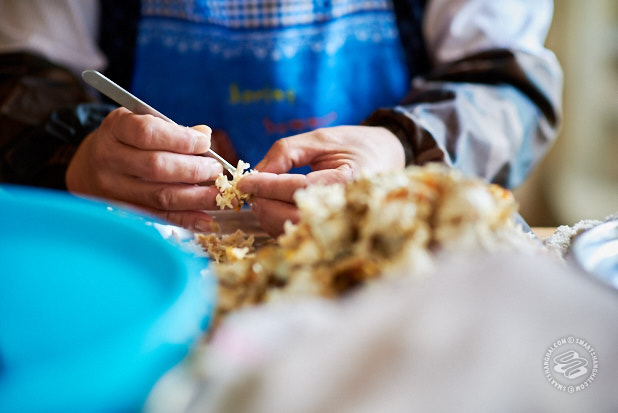 The hairy crab business is seasonal, four months on and eight months off, and Xu now spent the down time seeking out spiritual masters in Shaanxi’s Zhongnan mountains. He found a Daoist master, a Buddhist master and a master to teach him the philosophies of Confucius. He began to believe that meat-eaters weren’t just consuming the flesh of the animals, but the animals’ state of mind. Not wanting to interrupt the natural order, he let his hair and wispy goatee grow out. He changed his given name from the aggressive ‘Sword’ to a word that described his new self: jing, which can mean something like calmness or purity. For all the change, Xu still had a business based on taking the lives of animals: his own crab farm at Yangcheng Lake, a shop on Kaixuan Lu and a network of customers in Shanghai. “I looked at it this way,” he explained. 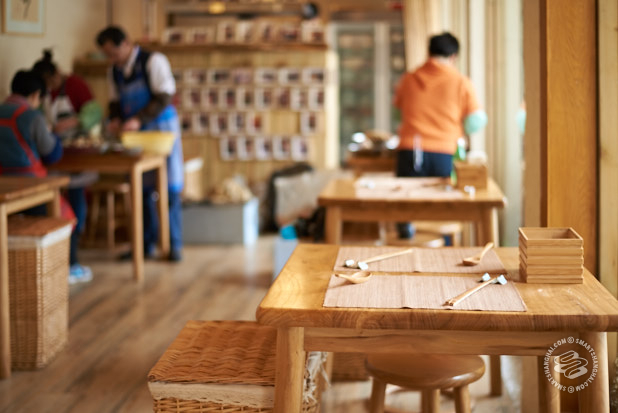 He converted the storefront for his wholesale crab business into a tranquil restaurant, with just three things on the menu: noodles with crab roe, noodles with crab meat and noodles with a crab-and-pork lion’s head meatball. (Even then, the third one is not available at the moment). Behind us, a small disassembly line was processing the last of the morning’s delivery. 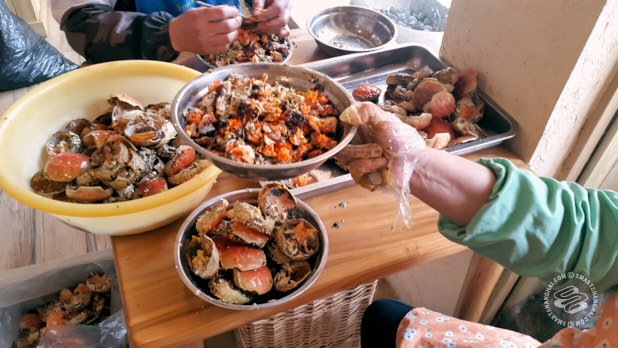 About three hundred and fifty hairy crabs had been chauffeured directly from Xu’s Yangcheng Lake crab farm to the restaurant early that morning. They had spent their final morning as they had spent their entire life, eating natural feed and listening to music -- high-pitched instruments like the violin and guzheng are best, Xu says -- before meeting their fate in a cloud of steam. 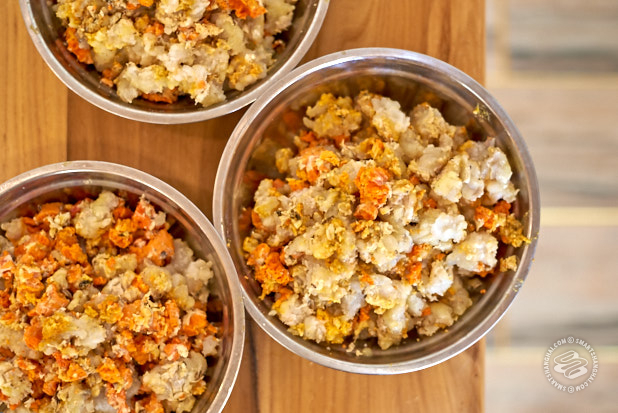 Now, the nimble hands of the crab pickers were separating them into orange roe from the females, white gao from the males, fine crab meat from the body, and legs they would later cut open one by one with small scissors. The entire restaurant -- which is to say 18 seats and a small kitchen -- was filled the muddy aroma of steamed hairy crab. The day’s first customers came in as Xu was in the middle of some parable about perception and reality, or maybe the one about the cellular nature of the universe. I think I had asked him about crab farming. By now, I was ready to get out of the metaphysical discussion and into the reason people come: food. However he arrived at it -- spiritually or otherwise -- Xu alighted on a basic truth of cooking: simple is best. The idea to open a restaurant came easily, and out of nowhere, he says, but reality, as is often the case, wasn’t so straightforward. Xu didn’t cook and there was the slight problem of not being able to taste his own food. 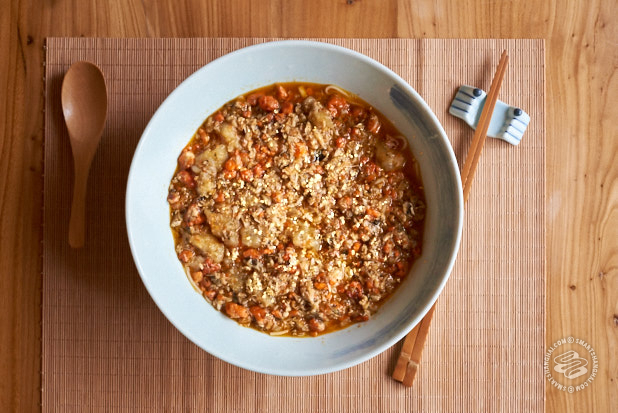 Chefs came to help him develop his menu and “they would make all these beautiful moves”, Xu says, waving his arms around, but then they would start in with defilements like Sichuan peppercorns. “I had to tell them ‘no, no, no’. It looked great. But it wasn’t what I wanted,” says Xu. What he wanted was purity and simplicity and he found it by himself: a scoop of fragrant lard, a spoonful of salt and a splash of a flavored vinegar. Noodles underneath, a ladleful of cooking water and, for the luxury noodles, a sprinkling of gold flakes -- “for the health benefits”, he says, though this is where things become a bit confusing. 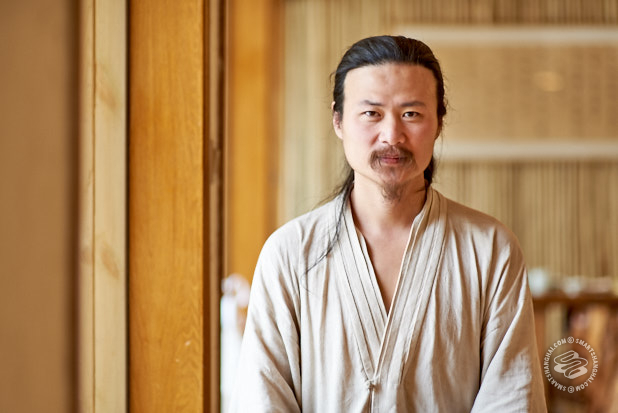 There is hardly a feature of the restaurant that Xu can’t tie to a philosophical belief, from the storefront windows (the five elements) to the price of the noodles (360 degrees in a circle = 360rmb), which he says he has set high on purpose. “The price differentiates our customers,” Xu tells me, though it’s not clear why someone who seems to have rejected materialism uses money as a filter. Xu wants to unite humanity, stamp out violence and aggression, and wake people up to the rat race of consumerism. How does the Birkin bag of noodles do that? To Xu, there is no contradiction. In this view, there’s no conflict between Xu’s message of purity and minimalism and his menu. Customers have told him the simplicity of the noodles make them want to cry, and it’s this effect, he says, that will spread his message. Rich people and celebrities tear up at lunch, the theory goes, and then tell the rest of us. Changing the world one celebrity at a time. Xu and I move over to the small open kitchen. 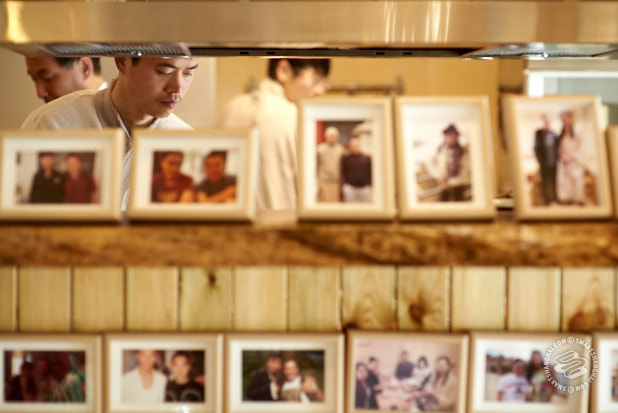 Calligraphy hangs on many of the walls but the kitchen counter is covered with pictures famous actors and actresses, some posing with Xu and some with a business partner. I try to reconcile the last two hours of spiritual talk to this shrine of desire, and to take stock of a man who wears the same thin robe every day, yet doesn’t consider the most opulent bowl of noodles I’ve ever seen to be finished until it has gold flakes on it. Xu is scraping mountains of bright orange roe into the wok. I begin to wonder if this is not the most selfish possible noodle dish, and just how much marketing (if any) I’ve already consumed. It won’t stop me coming back. I believe in occasional indulgences, especially when they are this delicious. But I feel guilty for the doubts. I need to divine Xu’s motivation one last time before I sit down to eat. Is Cejerdary the pinnacle of materialism or the antidote? I wonder if he’s learned how to read minds yet. Fun article! This guy sounds like a bit of a knob, though. great one, i've walked by that place every day for past few years and have always wondered what is up with that guy. i'll never be able to afford the noodles but hey, the more you know right.